Artwork to be picked up by artist unless other arrangements for shipping have been made. Artwork with prior arrangement including prepaid return shipping labels will be packed and returned. Angelo di Petta has a long and illustrious history in ceramic. His teaching career at OCAD spans over 35 years. He has lectured in Canada and the US, exhibited internationally and has numerous publications to his name. Generous with his knowledge he continues to teach workshops in mould making, surface decoration and design. Lesley McInally’s work is heavily influenced by her country of origin, Scotland, where she studied ceramic and printmaking. Her stretched paper clay vessels are highly textured which have earned her numerous prestigious awards and grants. Eligibility: Open to all ceramic artists 18 years and older residing in Southwestern Ontario. Artworks must have been completed within the last two years. Submitted work may be either functional or sculptural. Media: All works must be primarily ceramic. Mixed media works will be accepted only if clay comprises at least 80% of the artwork. Must not be smaller than 6” and no larger than 30”. The jurors will make all final determinations. Anything over 25 lbs or complicated needs to be set up by the artist themselves. The London Potters Guild reserves the right to use submitted images of artwork for publicity, documentation, education, and promotion. CD’s and memory sticks will not be returned. Sales: The London Clay Art Centre will take a 30% commission on sales made during the exhibition. All submissions must be eligible for sale. Rules: All accepted work must remain for the duration of the show. Submission of the entry form signifies the artist’s understanding and acceptance of the rules of the exhibit. Opening: The exhibition opens Thursday November 3, 2016 with a reception from 7:00 pm – 10:00 pm. 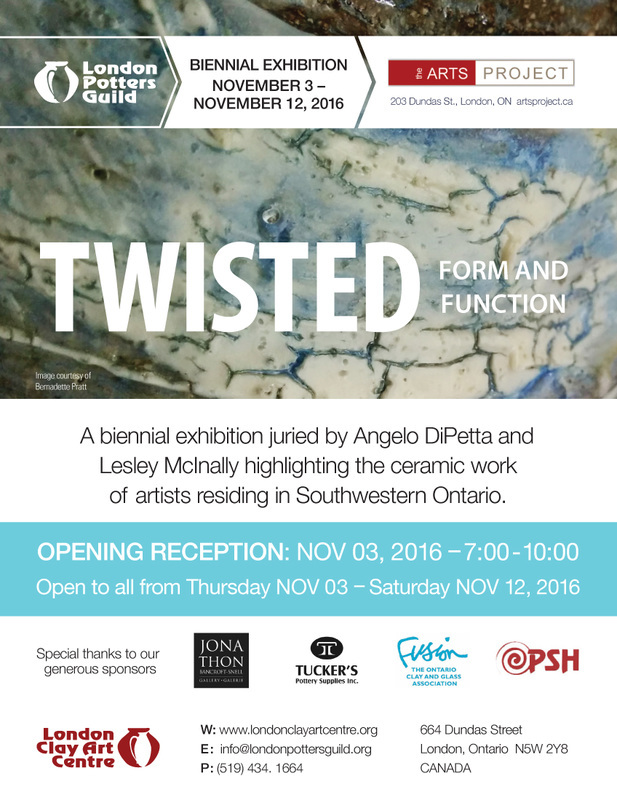 It will be held in the North Gallery, The ARTS Project, 203 Dundas Street, London, Ontario. The exhibition closes November 12, 2016. Shipping: Artists are responsible for shipping their work to and from the London Clay Art Centre and insuring it while in transit, during the exhibit and the return transit. Shipped entries must be securely packed (no styrofoam peanuts) and sent in substantial reusable containers. Double boxing is strongly recommended. Accepted works should arrive at the gallery no later than October 31, 2016 by 12 noon. Return Shipping: Artists must make prior arrangements with the London Clay Art Centre and must provide containers and a pre-paid return shipping label to cover return shipping costs of unsold items. Artwork left with the gallery for more than 15 days following the closing of the show becomes the property of The London Potters Guild. Liability: Every reasonable precaution will be taken during receiving, installing, exhibition, and return of work. The London Potters Guild, its members, volunteers, and The London Clay Arts Centre will assume no responsibility for loss or damage incurred. Artists must carry their own insurance.